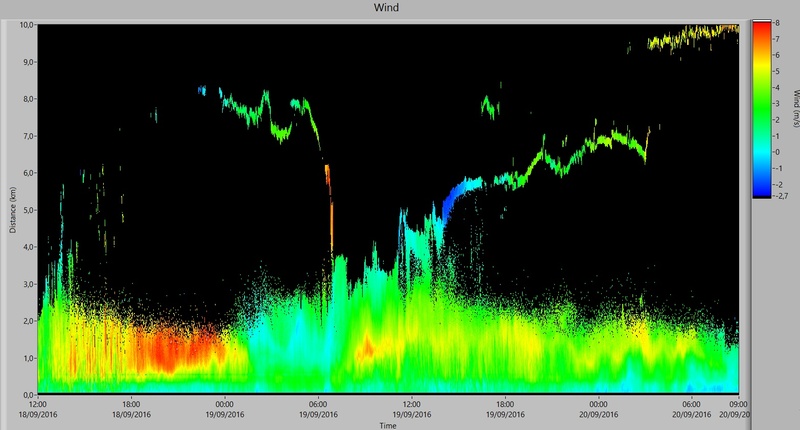 Below are some examples of wind measurements. 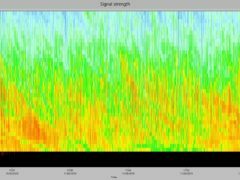 The illustrations show the wind speed and the image of signal strength. Below are some examples of wind measurements. All illustrations are measurements in a fixed direction. 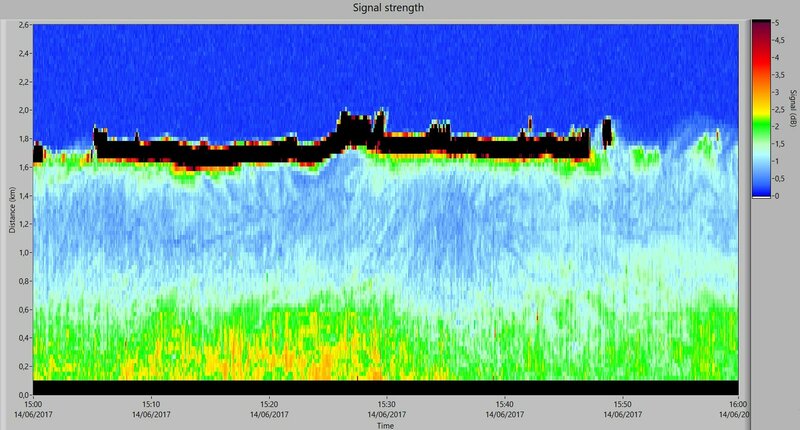 In the left image (upper image for small views) the wind speed in m/s and in the right image the signal strength in dB are represented by the colour. The X-axis is the time scale and the Y-axis is the distance to the instrument. 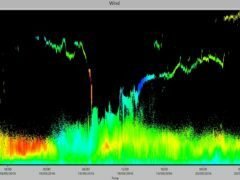 The wind speed is always the component along the laser beam. 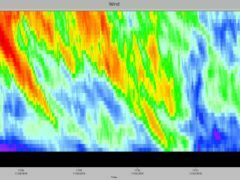 Positive velocities are wind directions towards the system. The following images were taken with an elevation of 57°, i.e. in a relatively steep upwards direction. They show a section of one hour during a typical early summer day with strong thermal winds. 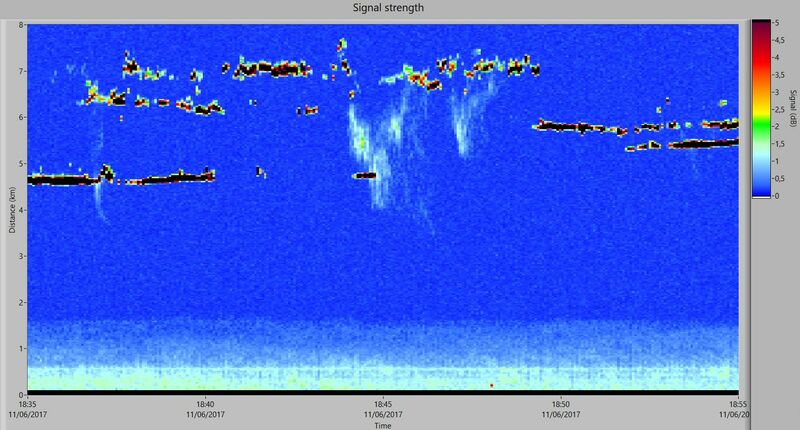 The pattern of the signal strength shows that a cloud crosses the measuring range (strong backscatter signal from about 1.8 km between 15:05 and 15:48 h). In this time range, the alternation between strong updraughts with up to 6 m/s and downdraughts can be clearly seen. 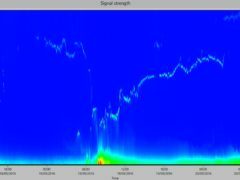 This measurement was taken at a pulse rate of 8 kHz, averaged over 0.5 s (i.e. 4,000 shots). 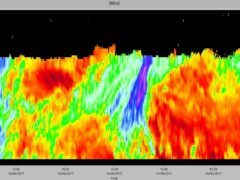 The following images show a section of 20 minutes taken three days before with the same measuring parameters. 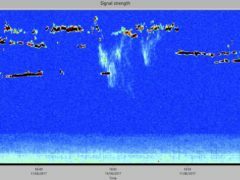 Cloud signals are very well visible at different distances between 5.5 and 7.5 km. In addition, there are areas with precipitation. 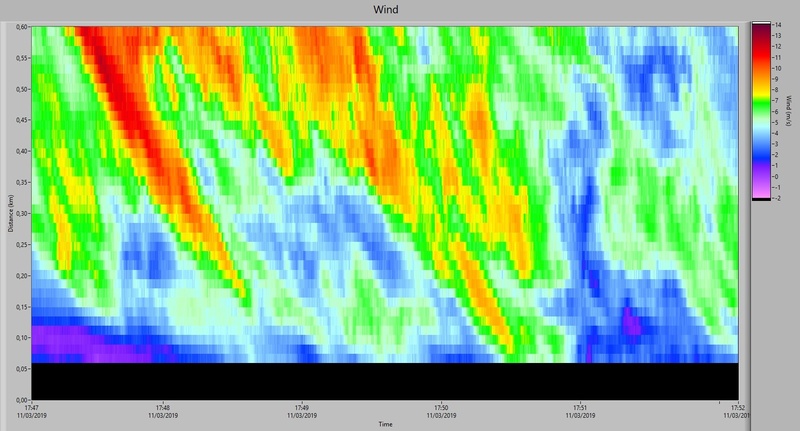 At 18:37 and 18:45 h it is even possible to see how precipitation from higher clouds moves through lower clouds. 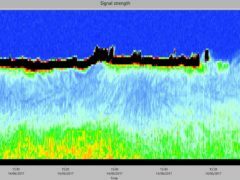 To test the performance with very short averaging times, measurements were taken with only 0.05 s averaging time (500 shots averaged at 10 kHz pulse rate). 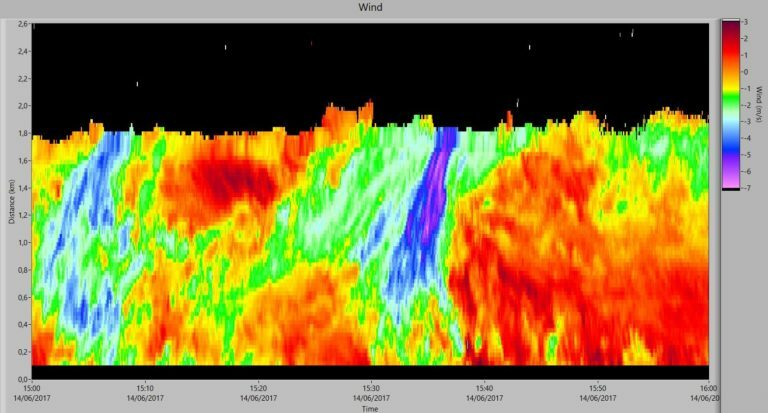 The following images show a section of 5 minutes where gusts with a wind speed of up to 14 m/s can be seen moving towards the system. These measurements were taken at a flat angle of only 6° elevation. 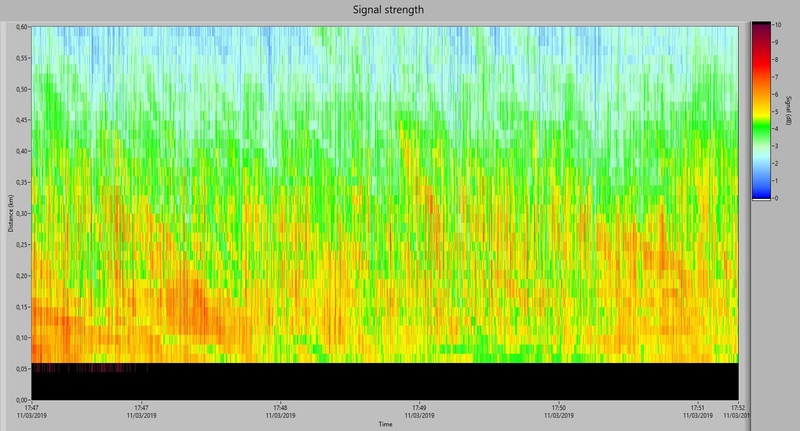 The following images show wind speed and signal strength for a wind measurement with 13° elevation, i.e. at a relatively flat angle, measured over a period of 45 hours on two typical late summer days. 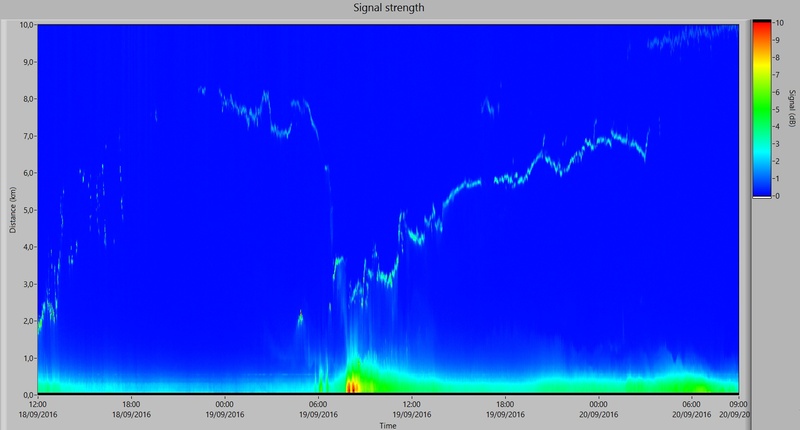 On the first day, strong fluctuations due to thermals are visible. 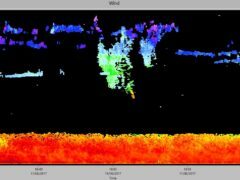 The points at a distance of 5 to 6 km are caused by backscattering on isolated small clouds. At night the wind became more continuous. 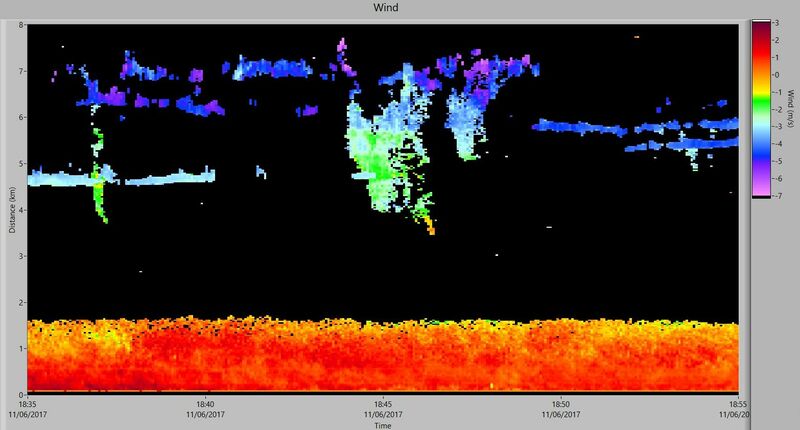 From about midnight a continuous cloud cover formed, which remained intact at different altitudes until the end of the measurement. These measurements were taken at a pulse rate of 10 kHz, each averaged over 0.5 s (i.e. 5,000 shots).